Chocolate Ganache is the perfect chocolate topping to any dessert and it only takes one minute and two ingredients to dress up any dessert! We love adding chocolate to our favorite homemade desserts along with Whipped Cream and Vanilla Ice Cream for the perfect dessert add-ons. 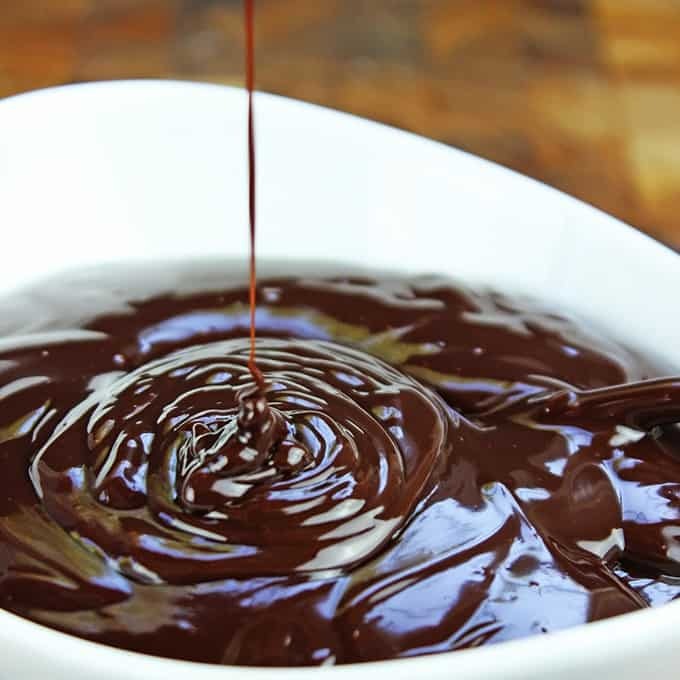 Chocolate Sauce is one of the easiest “recipes” you’ll ever make and the first time you read this one you’ll have it memorized permanently because it really is that easy. The thing about this recipe is that it was the first one I ever used as a dinner party trick to impress clients as a trained chef. 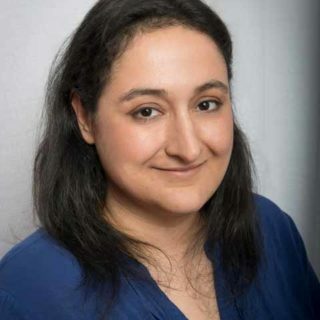 Want to know how to make clients ooh and ahhh? Take some chocolate disks, add some heavy cream (also known as whipping cream) and microwave it for one minute. Let them sit for one minute, whisk the hot cream for 30 seconds and you have the silkiest, smoothest chocolate sauce you’ve ever made. I promise, you will never buy bottled chocolate sauce again. The recipe is just a ratio of chocolate to whipping cream. 1:1 ratio. If you let the ganache cool completely and harden in a refrigerator it would be a slightly less hard version of my recipe for Chocolate Truffles without the cocoa powder that I roll them in. 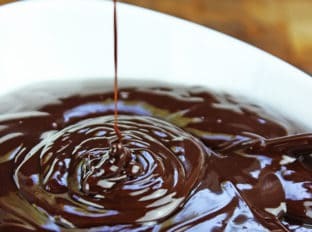 You can use a double boiler to make the ganache as well, the microwave is just easier and doesn’t require ensuring you have a heatproof bowl that won’t crack over the small saucepan. 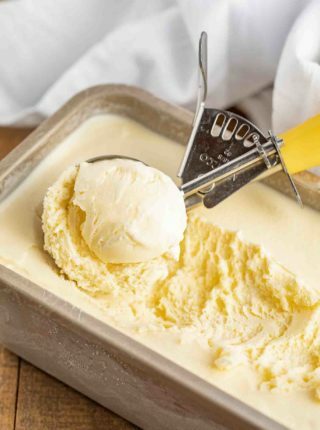 Top Vanilla Ice Cream with it, let’s enjoy classics for a second. Make a banana split with Strawberry Topping and Pineapple Topping. 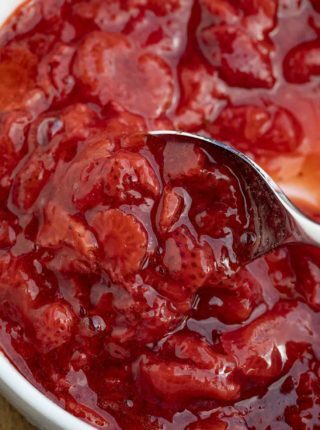 Dip Strawberries in it, using any kind of chocolate you’d like, dark chocolate, milk chocolate, semi-sweet or even white chocolate. Let it come to room temperature, then whip in a stand mixer for 3-4 minutes until light and fluffy for a frosting. Whip softened cream cheese and pipe it between two Chocolate Chip Cookies. Add it to a layer cake, like Chocolate Cake as a filling. Dip fondue dessert favorites in it like graham crackers, marshmallows or pound cake. Add 1/4 cup of peanut butter to the mixture and whisk well, the chocolate peanut butter mixture when warm will drizzle perfectly. Pour into a small pan and let cool in the fridge to enjoy like a fudge! You can add toppings too! Dip candies or caramels in it and let it harden in the fridge. Add milk to it for Chocolate milk or add warmed milk to it for hot chocolate! I have successfully done this with white chocolate, milk chocolate, semi-sweet chocolate, bittersweet chocolate and even unsweetened chocolate (for a more complicated dessert recipe that involved adding other sweetened ingredients later). IF you somehow end up with grainy sort of broken sauce (think like an oil based salad dressing) do not add more cream. Add 1 tablespoon of water to it and keep whisking over low heat. If still not emulsified try a second tablespoon. 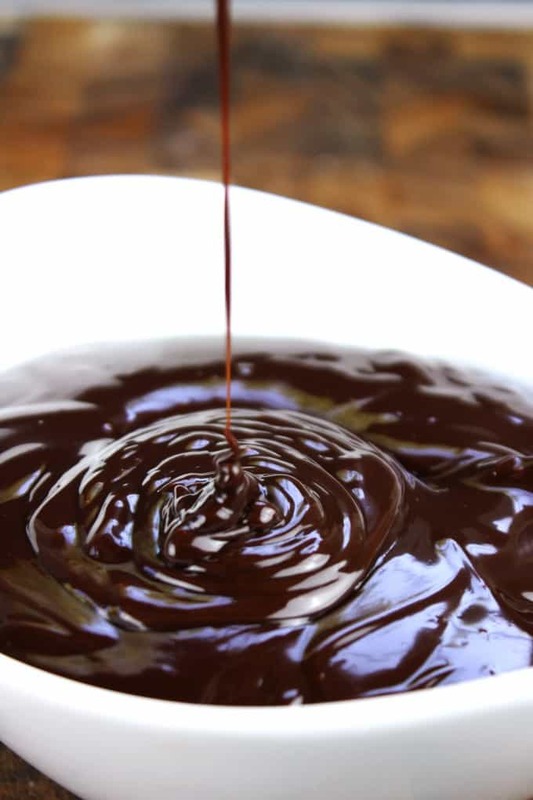 Add 12 ounces of your favorite chocolate to a bowl. Add 12 ounces of heavy cream on top. Microwave for 1 minute. Now just let it hang out for 5 minutes. Argh I know, I promised you one minute but should this time really count? We’re not even doing anything, just I don’t know, scooping out our ice cream while it all melts? All done now, whisk together. Boom. Best Chocolate Sauce ever. IF you somehow end up with grainy sort of broken sauce (think like an oil based salad dressing) do not add more cream. Add 1 tablespoon of water to it and keep whisking. If still not emulsified try a second tablespoon. Heavy Cream and Chocolate come together to make the most indulgent, rich Chocolate Ganache and it only takes one minute of cooking time! Add chocolate and heavy cream to a bowl and microwave for 1 minute then let sit for 1 minute. Now let it hang out for 1 minute, then whisk together for 30 seconds. I tried this method to make a vegan ganache and it worked out well. Thanks. Yes, it does get thicker as it cools. Hope you enjoyed it! 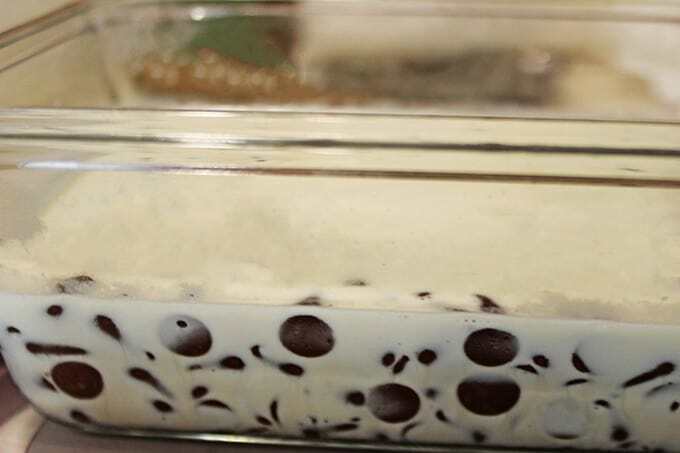 Can chocolate chips be used for this recipe, and for a cake do you just pour it on and let it drip down? Yes, use chips, they’ll work just fine! Yes I pour this on cakes all the time (remember to refrigerate since it contains dairy). What a sweet gesture for your friend! It is thin enough to go through a squeeze bottle but you really don’t want to make it too far ahead of time otherwise it will harden up. 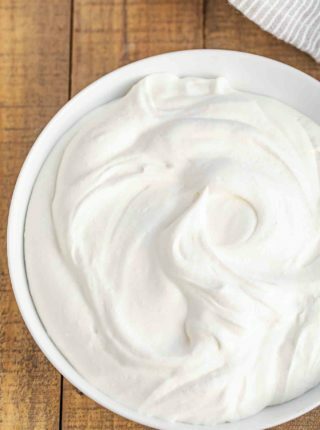 If you want to make it thinner, you could always add more cream. Awesome! Favorite cheffie party trick ever! This looks absolutely divine! I can use it for so many different things this holiday season! This ganache is heavenly!! I can eat it on pretty much anything, from bacon to cupcakes! Yum! The ganache looks so rich and delicious. I want to try this. Thanks! Come back and let me know how easy it was! This looks like a perfect recipe – simple and delicious. I think I love your strawberry idea best. Yum! Thanks! It’s a really useful recipe! Ganache is my go to for everything – frosting, glaze, truffles – it’s the best! that chocolate looks amazing. wow. I cant believe you can make something that looks so amazing in 1 minutes. This is a def must try. This is so easy to make i do not know why i have never tried making it before. It is so delicious i am going to make some this weekend. Thanks! 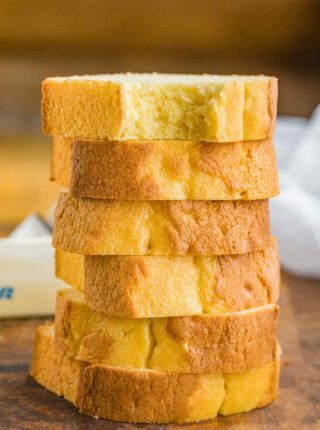 It’s really an easy, delicious recipe! This looks so delicious. I can think of a few great recipes i can use this in. I am excited to give it a try. I have never tried making this before. I will have to get the ingredients together so i can make this delicious recipe. Thanks! It really is as easy as advertised! Can I just choose all 10 of the ways you suggested to use the Ganache? Yum! I am sure the strawberries dipped in it would be especially delightful! I remember learning that ganache was that easy and being blown away. It is so good! will the ganache harden as cake icing after a day the fridge. You just gotta love a ganache that is ready before you can sneeze! wow love the shiny color, and all that melted chocolate makes me really hungry! Pinned! Thanks for the pin Katalina! One minute of cooking time??? I’m in chocolate heaven!!!! This is such a dangerous technique to know! I foresee multiple batches of microwaved ganache appearing in my kitchen and multiple pounds appearing on my bathroom scale! Avoid the scale for 1-2 days after haha. This is really helpful! I’d love using this for a few different desserts or simply for dipping. Oh my goodness, this is so super-simple… how have I not made this before. Thanks so much for the recipe. I will be making this the next time I have a party. It would be perfect for just about everything. I promise if you try it you will forever remember it every single time you want chocolate! Oh this is too easy! I have got to try this! Shared and pinned for a later date! Can’t wait to eat this up! Thanks for the pin! I hope you try it! This looks so good. I’ve never made ganache before, but this makes it seem like I could fairly simply! VERY simple! You’ll love it! Oh my gosh all that chocolate looks heavenly! I love how easy this is to make I am going to have to try it out. Hope you love it Vera! Wow that is so fast and easy to make, brilliant! That looks so amazing. I love how easy it is to make, too. I LOVE Ganache! I usually try to put in on and in cupcakes, but these gives me SOO many other ideas! This ganache looks amazing! Who knew it was so easy to make! I want to lick my computer screen. That looks all kinds of awesome. Haha, might not taste as good. That looks absolutely fantastic. Chocolate ganache is one of my favorite things. Thanks! And it’s so easy to make too! I feel like I make this AT LEAST once a week. We try to keep a tub on hand for last minute projects too- it’s delicious! Oh man, now I want a tub of it!